Charlie Yoder’s paintings have a larger-than-life presence. Usually occupying the better part of a gallery wall, they command your attention with their graphic rhythm and realistic detail, offering as much intrigue and mystery as the actual scenes in real life. This is an appropriate way for the six-foot-eight artist to work, as it matches both his temperament and the dramatic light-and-shadow views of nature to which he is drawn. Facile in numerous forms of media and genres—painting, design, linocuts, monotype, silkscreen—and driven by both big-picture abstraction and close observation, Yoder has been flexible enough throughout his life to move in different stylistic directions as needed, merging various influences and discoveries until he found his artistic voice. Yoder had a most interesting and formative experience as a young artist living in New York in the 1970s and 1980s. In addition to becoming the director of modern-art mogul Leo Castelli’s print gallery, Castelli Graphics—which sold the prints of such Pop Artists as Andy Warhol, Jim Rosenquist, Roy Lichtenstein, Claes Oldenburg, and more—Yoder was also the curator for the famous painter Robert Rauschenberg for more than ten years. He traveled with the artist around the world, installing and de-stalling his retrospectives and observing first-hand the life of an internationally recognized artist who wasn’t afraid to combine different media and color outside the lines. Eventually, it was time for Yoder to refocus on his own art. A few major life events—including an artistic epiphany in the moonlit woods in the winter of 1997 and the discovery of Simon Schama’s Landscape and Memory book—led him on the path he is currently on now: out in the middle of nature, meditating for as long as needed on a powerful scene, extracting the essence of what makes the view visually compelling. In this Q+A, Yoder documents that journey in journal-like detail, sharing several stories, chance encounters, and surprises along the way. AM: You initially studied illustration at Pratt Institute, eventually concentrating on printmaking, silkscreen, and painting. Today you continue to work in many different media: oil, acrylic, monotype, linocuts, silkscreen, etc. How would you define your style/the melding of those media? CY: I entered Pratt as an illustration major but quickly found that having other people in control of my art was not interesting to me. I switched to fine art, where I concentrated on silkscreen and lithography. I had not done much painting at this point and was uncomfortable with it at first. Three teachers were patient and supportive: Michael Lewis, James Gahagan, and Jake Berthot. Their attention is still appreciated. Still, I feel that going to museums and galleries and hanging out with other artists exposed me to most of what I know about art. Charlie Yoder, A Light Touch, 2005, oil on canvas, 48 x 62 in. AM: When you were in your twenties you landed your first job at Castelli Graphics, started by the famous contemporary art dealer Leo Castelli. Was this the place where the prints were produced or the gallery where they were exhibited? CY: Castelli Gallery was a retail graphics outlet for the artists that Leo represented. The inventory came from several sources. Sometimes, the artists would consign work they had had published by professional printers. Sometimes the gallery would buy work from publishers and/or fine-art print shops. Other times we would, singularly or in partnership with others, arrange a deal between the gallery, the artist, and a print shop to do a limited fine-art print. Leo’s gallery showed unique pieces of art and Castelli Graphics showed limited-edition prints and multiples (limited-edition sculpture). These were called original limited numbered editions. My boss was Toiny Castelli, Leo’s second wife. I was in my last semester of school when I started working there part-time in the summer of 1971. My original tasks were to make trips to the post office, run errands, clean and wax the floors, and wipe fingerprints off the walls. I would hang shows under Leo’s supervision and show art to customers as directed by Toiny. When I graduated from Pratt with a B.F.A., I was hired full-time. Having experience in printmaking served me well, as no one at work knew the difference between one print medium and another. Charlie Yoder, Color Field, 2014, acrylic and oil on canvas, 38 x 56 in. I soon met many people involved in the contemporary art world: artists, collectors, gallery owners, art writers, and assorted hangers-on. Leo’s artists were Post- Abstract Expressionists such as Jasper Johns and Bob Rauschenberg and Pop artists such as Andy Warhol, Jim Rosenquist, Roy Lichtenstein, and Claes Oldenburg. Other big-name talents were Frank Stella, Richard Serra, Ed Ruscha, Keith Sonnier, Don Judd, Dan Flavin, and Bruce Nauman. Strangely, or maybe not so strangely, I had no real sense of how special and unusual a job this was for a young artist freshly arrived from Maine. That realization came much later. It was interesting work with interesting people and paid a living wage. I considered myself lucky. Still do. AM: You must have many colorful stories and memorable encounters from working there. Can you briefly share one? CY: To briefly share one experience would be to give short shrift to so many experiences. Which to choose? The wildly drunken wine-tasting Sunday brunch in Dan Flavin’s home studio in Garrison, New York with the owners and staffs of three of the galleries that showed his work and the stumbling romp with selfsame staffs through the woods afterwards? At the Factory when I was talking to a friend about witnessing a shooting and how surreal it was and I didn’t see Andy standing next to me … he responded “Yeah. Even when it happens to you, it’s like you’re watching TV.” Being around Ed Ruscha and his beautiful movie-star girlfriends? Getting to know Keith Sonnier and all the sculptors, painters, musicians, dancers, photographers, and performers from Louisiana and their friends? Such fun. Charlie Yoder, Murder Incorporated, 2010, acrylic and oil on canvas, 71 x 88 in. AM: You obviously met Robert Rauschenberg because he asked you to be his curator, which you did for twelve years after leaving Castelli Graphics. What influence did being in his world and seeing art through his eyes have on your own work? I was at the gallery for about five years and was the director when I left. I consider this the beginning of my Master’s degree. Shortly after, Bob asked me to be his curator in his New York studio/home. The work was much like what I had been doing at the gallery, just much more involved. He had a great bunch of people working with him, and it was a fun and interesting environment. Bob was supportive of the artists who worked with him, but also expected a lot of time and effort to be spent caring for his needs. He traveled constantly internationally and back and forth from the East and West Coasts and between New York and Captiva, where his main studio was. My art took second place. I found hanging with Bob was an easier way to be a part of the art world than me working in my studio and slowly finding my own place. I was painting and showing my work but definitely not enough of either one. I started painting more and showing more. I met a tall good-looking blonde interior designer named Charlene and we hit it off. We were quickly “an item.” Then Bob called one night and asked me to work with him on the ROCI world tour. I couldn’t say no. It was to be a five-year tour around the globe installing an ever-changing retrospective with new work added to each venue: Mexico City, Santiago, Chile; Caracas, Venezuela; Beijing, China; Lhasa, Tibet; Tokyo, Japan; Havana, Cuba; East Berlin; Moscow; and Kuala Lumpur, Malaysia. I’d travel to each country, unpack and install the show, sightsee, and return to the States. Then I’d return to the current country, take down and pack up the show, and take it to the next country and start all over again. This was the routine more or less with some variations for the next four-plus years. The biggest variation in the plan was me quitting after Cuba. The tour went to East Berlin and Moscow without me. Then Bob called and asked me to be in on the finish of the tour in Kuala Lumpur. I couldn’t say no. Charlene met me there and after the opening, we went sightseeing in Bali and Java. Charles Yoder, Short Cut, 2006-2007, acrylic and oil on canvas, 52 x 160 in. Thus ended my employment with Bob Rauschenberg. We remained friends until the end of his life, but our working together was done. There are a couple of things that I picked up working with him. One is that anything can be art. All you have to do is say it is. Bob changed his work constantly, and he could make anything look beautiful. Knowing this made my abrupt switching from abstract to realism a lot easier. The other lesson was that you have to work constantly to get solid consistent results. These were important lessons. A couple of things, both very different, happened in my life that brought about important changes. The tall blonde and I moved in together and got married. Married life agreed with me. I spent more time in the studio, got more work done, got a gallery, had shows and started selling artwork. The other important change came with the loss of a very good friend, Al Taylor. Al was a sculptor, draftsman, and printmaker, whom I came to know when I started working for Bob. Al’s girlfriend Debbie was Bob’s curator, and I became Bob’s curator when she quit to work for Leo Castelli. Really a small world, wasn’t it? Al and I worked together for about three years or so at Bob’s and became very close. We spent a lot of time together after work as well, bars and clubs and art shows and the like. After he stopped working for Bob, our friendship continued. He got a studio on East 19th St. and Park Ave. South. On many afternoons around quitting time, I would meet there with other mutual friends and we would drink and smoke and talk and listen to music. During these get-togethers, Al would be the only one working. He was always working making the most beautiful, lyrical and, often, very witty works. His early death shook me. I realized that I had been taking my life as an artist for granted. I was delusional to think that there was plenty of time to get work done. To develop a body of work that was worth something, or important to me at least. To get it out into the world. Al was a month older than me, and it became clear that if I wanted to get anything worthwhile done, I had to take more control of my time. AM: I know that back in 1997 you had an artistic epiphany in the woods at night. In your own words, what happened in that moment? CY: A couple of years before Al died, I had that epiphany that I’ve talked about. I had been dissatisfied with the large abstract paintings I had been doing. These were eight-foot by five-foot swirls of monochrome oil paint on canvas. They were pretty, but I found them ultimately repetitive and restrictive. I had mixed some imagery and text into some of them but they still weren’t clicking. What I’m doing when I create does not always follow the original “logical, well-thought-out, predetermined” course. I may think it will happen, but it seldom does. Something sparks a beginning and when it’s done, I find myself justifying the “predetermined plan.” Why I did what I did becomes a bit of fiction. Maybe it’s better described as an alibi. One winter’s night around 1997, I was out in my backyard in Northwest Woods in East Hampton in the middle of a stand of tall pines. I was ankle-deep in snow watching the light of a full moon shining down through the boughs and the shadows it made dancing across the bright white snow. I was struck by how beautiful it was. It was so simple, but it had everything I was looking for in art-making. Light and shadow. Rhythm and tempo. All I had to do was look and copy it. Charles Yoder, Tree Rings, 2012, one-color linocut, 16 x 26 in., edition 14. AM: Please compare and contrast what your life as an artist was like before this breakthrough and then after. Have you had any additional types of realizations or important “game-changers” in the studio since? CY:I thought it was going to be really easy but, of course, it wasn’t easy at all. But that moment excited me and got me started on the journey I’m still on. The first painting took three months of many trial-and-error efforts before I got a result I was satisfied with. Over time, I came to realize that all seasons, all times of day and night, all weather conditions, and all venues of nature were worthy subjects to study and that also dealt with realism and abstraction. I had read Simon Schama’s Landscape and Memory, which was about the influence of a nation’s geography on its self-image. It was broken down into four chapters: woods, water, rock, and a combination of the three. I thought this was a perfect outline for a career. I’d spend five years with each section and end my life working on the fourth chapter. I couldn’t foresee how fascinated I’d become with “the woods.” Each time I would do one of the other three, I’d find something that pulled me back. Again and again, I’d see something that grabbed my interest. This was the glimpse that brought on a meditation of looking until I saw. Looking for the essence of what was so special. Sometimes I’d start painting right away. Other times it’d take four or five years of sketches and watercolors, even print editions before the painting began. There was no rhyme or reason of how it would proceed. I continue to find artists that spur new explorations like Fairfield Porter, Lois Dodd, Neil Jenney, Matisse, Monet, Bonnard, Vuillard, Hokusai and Hiroshige. Rauschenberg still gives me permission to do anything I do. I find that the more I look, the more I see. The more I paint/draw/print, the more accurately I can depict that special moment that attracted me in the first place. AM: Your paintings are created large-scale (sometimes very large-scale), which best suits the kind of expansive vistas and dramatic light effects you are capturing. Finding a place with enough space to exhibit that type of work can be challenging. If you could build or commission the creation of the ideal space to show your work, where would it be? CY: Years ago a painter friend castigated me for making small paintings. “You’re a big man. Make big paintings,” he said. It made sense. I like large paintings because it fits my arm span and the space I occupy. I like the idea of experiencing paintings that involve time and space. I’m aware of the absurd reasoning of making objects that so few people can accommodate. No matter what the size, there is really no logical reason to make art. So size doesn’t enter the equation other than some sadomasochistic urge to have desire met with a certain degree of disinterest. Of course, having said how futile this activity of making large-scale work seems to be, I know that out there in the world are large corporate lobbies, board rooms, and the mega-mansions of billionaire art collectors. I saw Rauschenberg fill them. I am currently satisfied with the size of my painting walls, which are about eighteen to twenty feet wide. At this time in my life as a working artist, affordable and sustainable storage is a big concern. Charles Yoder, Once in a Blue Moon, 2014, acrylic and oil on canvas, 40 x 64 in. AM: You currently have a solo show on view at the Atelier at Flowerfield titled Natural Resources that highlights a selection of your work from the last twenty years. What was it like to see all of those paintings in the room at once? Is there anything you can see in the work from your perspective now that perhaps you couldn’t see then? CY: The current show at the Atelier at Flowerfield is an unexpected and welcomed gift. Kevin and Margaret McEvoy have offered me the rare opportunity to show many of my large works. Full Circle is a triptych portraying the four seasons in a single day. It measures four feet by twenty-four feet and from start to finish took nine months of working every day. Borderline and Short Cut are fourteen feet long. My studio allows a viewing distance of about nineteen feet. Atelier Hall offers about thirty-five feet or so. The compositions, rhythms, and color changes look so different to me from these distances. I’m enjoying looking at these with “fresh eyes.” To see twenty years of work in one place has reinforced my belief that I am mining a rich vein of material. The paintings have not become easier. They just continue to pique my interest. AM: You have said that you see each painting that you make as a mediation on a glimpse, and you have also alluded to musical metaphors. Would you also say that light is also an ascendant theme in the majority of your work? CY: I believe that all art involves degrees of light from full on to none at all…from too bright to see to too dark to see. All our senses respond to the different degrees of these rhythms and, as such, I see all this work as akin to musical compositions. Rhythms and tempos of light and shadow are as essential as are different values and timbres. A good piece of art sings. AM: I understand you are very involved in the Artists' Fellowship. Please tell us a bit about your role with this organization and the types of assistance and help it offers fellow artists. CY: Thanks for asking. I became President of the Artists’ Fellowship, Inc. two years ago. The Fellowship is a 159-year-old charity that provides emergency aid to professional artists in dire financial need. A fully volunteer board meets monthly to go over requests to help pay late rents, medical bills, fire or flood damages as well as other unexpected contingencies that artists’ lives are subject to. A majority of this board must be working professional artists. Last year we were able to give $270,000 to fifty-one artists. It’s a real honor and privilege to be involved with such a wonderful organization. "There was beauty, there was abstraction, there was representational, all wrapped up in one." 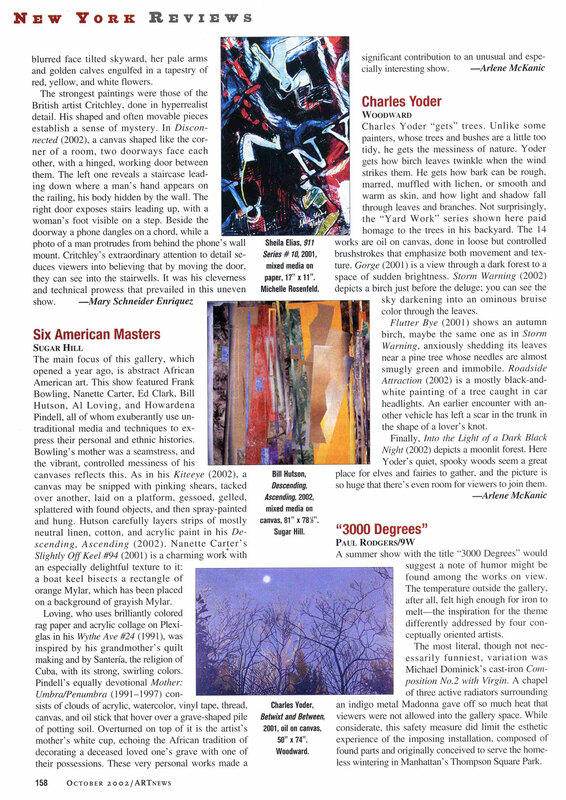 On a winter’s night 20 years ago in Northwest Woods, Charles Yoder discovered everything he was looking for as a painter. In 1970, while an undergraduate at Pratt Institute in Brooklyn, Charles Yoder took a summer job at Castelli Graphics, which had been founded the year before by Antoinette Castelli, the wife of the influential art dealer Leo Castelli. “I was doing prints myself, and I was the only one who knew the difference between a silkscreen and an etching,” Mr. Yoder said recently. He started at Castelli as a gofer and left, five years later, as director. That job was the start of almost 20 years at the epicenter of the art world. While there he met such Castelli artists as Andy Warhol, James Rosenquist, Claes Oldenburg, Dan Flavin, and, most significantly, Robert Rauschenberg. “After I left Castelli, I went on unemployment. Then Rauschenberg called me up and said his curator was leaving and he needed somebody to replace her.” Mr. Yoder worked for the artist on and off for almost 15 years. But the most important incident in his career did not take place in Berlin, Copenhagen, London, Beijing, Lhasa, Havana, or Kuala Lumpur, just a few of the stops on his travels with Rauschenberg. Instead it happened in 1997, in his backyard in East Hampton’s Northwest Woods. Not that it was easy. The next day he tried to paint what he had seen, but it didn’t work. He took some nighttime photographs, but that didn’t work either. It took three months for him to come up with “Dark Woods,” the first in a series of works that has engaged him for more than 20 years. While he started with nocturnes, he soon realized he could represent any time of day, any time of year, and any weather. Mr. Yoder works from his own photographs. He begins by lightly sketching in charcoal. He generally starts with an acrylic background because it dries quickly. “I make it really thin, like an ink, then I switch to oil, which has a warmth to it. I’ll break the canvas into quadrants, but I don’t do fine grids. I tried that, but it turns into photorealism.” In reproduction, the paintings can be mistaken for photorealism, but up close “gestural marks create the illusion of movement through light and shade,” the painter John Bowman wrote in a review of Mr. Yoder’s works. It is that quality, which varies from almost eerily mysterious, even foreboding in a work like “Rhythm in Blues” to the bright foreground of the daytime diptych “Borderline,” which darkens and deepens in the background, that transcends realism without abandoning it. Mr. Yoder was born in 1948 in Frankfurt, Germany, to parents who were both sergeants in the Army and whose work subsequently took the family to Nuremburg, Maryland, Italy, and various bases in the southern United States. When his father retired in 1963, the family settled in Maine, where his mother’s family lived. He spent three years at the University of Maine at Orono. When he first arrived there he was painting representationally, inspired by Andrew Wyeth, Norman Rockwell, and cartoons. He wanted to be a commercial artist. As he studied art history, his inspirations shifted to Rembrandt, da Vinci, Michelangelo, Raphael, and then Picasso. He transferred to Pratt after three years in Orono. A series of paintings from the 1970s, influenced in part by Warhol’s serial images, featured multiple, but different, faces arrayed across the canvas. One, “Eight People Close to the Edge,” was a hazy, 6-by-10-foot Hawaiian landscape with eight faces lined up along the bottom edge. Mr. Yoder first came to the East End in 1978 and rented for several summers on Three Mile Harbor. In 1984 he met Charlene Keogh, an interior designer. They were married in 1988, and three years later bought the house in the woods off Swamp Road where they live today. They also have a loft in Tribeca, and Mr. Yoder teaches lithography and silkscreen at the School of Visual Arts. In addition, since last year he has been president of Artists’ Fellowship, a nonprofit that financially assists fine artists and their families in times of sickness, distress, or bereavement. 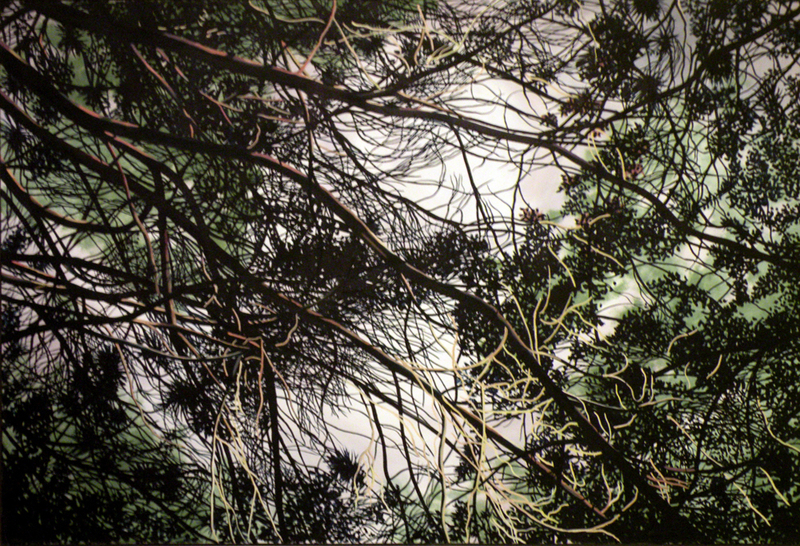 Charles Yoder’s “Mystified” captures the stillness and muted light of a forest on a gray day. To take one painting from a group of related works, Rhythm in Blues is a sweeping view of a small expanse of woodland near where a snow-covered terrain falls away, tracing a dramatic diagonal across the breadth of the canvas, a sort of languid bend sinister, while streaks of moonlit snow shoot across the ground, through a stand of trees, dark verticals of bare trunk, alternating with swathes of shadow in opposing diagonals creating a spreading chevron effect. The snow cover is pocked and clumpy in the foreground, more marbled in the distance. Beyond the lip of earth, the soft brushy collar of a lower, farther tree line hugs the lower reach of the subsiding left-right diagonal, and above it in the upper left quadrant of the painting glows a vaporous night sky with a distant opalescent moon hovering behind the trees. In the upper right corner of the painting all falls into the shadow of heavy foliage. The alternating lights and darks, the shifting spaces and solids, the striking dark vertical solid bars, slender or sturdy, the chill atmosphere, and the somber mood of the night hour propound a powerful, vigorous, yet controlled vision. One hears the roar of silence, one feels the internal combustion of solitude. The painting is panoramic yet without a vista. It remains intimate. The space is close, undercover, notwithstanding any glimpse of a beyond. One is as present as a viewer may project, nothing is so far away, but the atmosphere is cool, aloof, and yet telling. There is a sense of moment. Still, the artist is not telling us what to think. There is no moral, no narrative, though there is expectation. The sound track does not cue to mystery or malevolence or something more benign or sentimental. Charles Yoder is asking us to ponder painting hung on the scaffold of a forest, where trunk, limb, branch and twig, stem and leaf, are a profusion of painterly gestures. The rendering is highly graphic and the atmosphere redolent. Mood and tone prevail. The natural forms give abstraction an object. The title reminds us that the nocturne was first a musical term before Whistler appropriated it and others to underline the abstract, formal qualities inherent in his work. This painting is a kind of stalker’s dance. Though in nature trees may bend and groan, the wind may whisper, movement may be furtive, here all is stock still and silent as a painting is, but as if in the fatal pause before the pounce. For Yoder the elusive insight is the prey, the thoughts of a painter painting. And for the artist, it came in the night, standing in the woods, his painterly epiphany that the forest all around him was sufficient premise for painting. Yoder tends to paint from within the forest with only the occasional clearing or sketch of a path, looking through the woods at nothing in particular or down at the ground or up at the clouds, trading the thicket then for a maelstrom. His sky pictures though are always anchored by the silhouette of a tree line. In the nocturnes, Yoder uses the white of moonlight and snow and cloud to heighten contrast and illuminate forms and unify the overall all-over composition. The paint is dry, the color is flat, the contrasts are high. Twachtman used snow to dissolve the image, whereas Yoder punctuates the white with the dark umber of the woods to maintain the rigor of the edge. Up close the image surely fails, the forest quickly becomes a tangled rhythmic lattice. There is no attempt to reproduce surfaces and minor details other than calligraphic cursives and natural patterns, and yet the variety of effects is stunning, even as the overall body of work is unified. Yoder’s landscape is agnostic. There is no religious allegory, no sturm und drang, no manifest destiny, no apparent manifesto of any kind other than the absorption in the solitary purposes of painting or of a walk in the woods alone at night. These works signal a withdrawal into one’s own thoughts. They are meditations in paint and personal and yet with a healthy detachment, tuned to the utter indifference of nature, and so leaving plenty of room for his viewers. Poets from Shakespeare to Frost have pondered the winter forest at night in tenebrous meditations on loss and mortality. And indeed one may ponder the transitory nature of life, the inevitability of death, in the meantime one may walk and look thoughtfully and anticipate a warm bed in due course. At first glance, the oil paintings by Charles Yoder appear to be photo based realistic representations of verdant foliage and the shadowy precincts of a forest. Upon closer investigation, these works reveal an eloquent array of modernist painting approaches, a profusion of colorful gestures that coalesce into images that portray the varied rhythms of natural form. Viewing these works in reproduction does not prepare one for their visceral materiality; the physical presence conjured by passages of flat color and contrasting tonality. Some painted areas remind one of Hiroshige’s woodblock prints and reveal the influence of printmaking techniques in Yoder’s studio practice. Eschewing conventional glazing and rendering, he uses direct gestural marks to create the illusion of movement through light and shade. Willem DeKooning once said “Content is a glimpse,” and it is this statement that is a point of origin for these paintings. After a period as an assistant to Robert Rauschenberg in the 1980’s, Yoder forged an art practice largely hewing to contemporary modernist dogma, with a focus on process and non-objective abstraction. Finding his efforts lacking in a primal connection to his lived experience, he found himself standing in a pine forest in Eastern Long Island, observing the visual complexity of his surroundings. There he experienced an aesthetic epiphany that changed his approach to art making. He embraced the subject of another of his favorite artists, Charles Burchfield, who once commented, “I seem to have made a career out of my backyard”. Using this “glimpse” of woodland as a template, Yoder began a series of works that represent the surrounding trees as a forest of marks and gestures that re-create the physical presence of nature. His research begins with expeditions into the forest to find compelling passages of light and rhythm, the true “subject” of these large paintings. For one attempting to escape the prison house of language, Yoder betrays a delight in wordplay, puns, and the mutability of meaning in the construction of his titles. He attempts to subvert the solemnity inherent in sincere expressions of solidarity with “Nature” and utilizes these “slippages” in meaning to create ambivalence around what might otherwise be a surfeit of feeling. The larger paintings emulate the scale of nature and unfold over time as one moves past them, recapitulating the original physical experience of these spaces. Yoder claims to be pushing no environmental issue, other than an emotional appreciation of the sylvan experience, using paint to make this experience palpable. His process begins with vigorous action, as he plants the major forms and colors in the background of the painted space. As he moves toward the foreground, his technique becomes more detailed and nuanced, growing into a complex web of layered line and restrained color. The overall effect is one of vector equilibrium, where no one part of the canvas claims more importance than any other. This creation of a serene chaos, punctuated by abrupt pistol shots of light, captures the rhythm and timbre of lived experience. The experience of these works evokes metaphors more appropriate to musical expression, as vision dances in a forest of color and light. John Bowman is a painter living and working in New York City. Charles Yoder’s paintings are grounded in the ordinary facts of familiar and comfortable landscape environments, and yet they are mysterious and provocative in ways that invite deeper contemplation and reflection. In an essay on Mark Twain, T.S. Eliot commented that he doubted that “a poet or novelist can be universal without being very local too.” In a similar vein the poet/singer Leonard Cohen has observed, “Mystery is always grounded in ordinary fact.” We don’t simply take in the accuracy of observation and detail in Charles Yoder’s paintings: somehow, the paintings resonate more deeply within our consciousness, stirring up personal associations and memories…filling our experience of them with poetic complexity. In his book about the painter Georges Inness, Nicolai Cikovsky, Jr. quotes Inness as remarking, “Unity is the fundamental principle of all art”, … and it is neither an aesthetic or a visual effect, but a “great spiritual principle.” Inness further states “The chief peril to a painting’s wholeness (unity) is descriptiveness that calls undue attention to the things described and to itself as a feat of technique.” It seems clear that Charles Yoder has been able to achieve this ideal of carefully observed representation without losing that sense of the mysterious, of spirit. He develops his paintings with meticulous and subtle craft while maintaining a lively and spontaneous feeling that doesn’t necessarily underline the technical virtuosity of the work. The paintings communicate as abstractions as richly and fully as they communicate as literal descriptions. This is the unity to which Inness refers. It is the entrance into mystery. The use of color and value changes, the quality and character of varied illumination, the rhythm of the brushwork and mark-making, the sensual textures of the paint surface, the complexity and feel of space, the animated gestures and solid presence of forms… all of these intangibles, are fully unified partners with the outward physical descriptions. The paintings invite both recognition and very complex emotional, psychological, or even spiritual response. Charles Yoder’s paintings are both wonderfully accessible and mysteriously elusive. They’re not easy. The viewer is invited to collaborate with the paintings in a personal and intimate way to mine the treasures of their nuanced content.